A fresh take on A Star Is Born both elevates and hinders it. Why do you tell a familiar story again? That's both a rhetorical and a genuine question, especially when it comes to mainstream movies in the 21st century. Financially, there's security in returning to reboots and remakes, as most of the name-recognition marketing work is already done for you. But for a creative person, you have to hope it's exactly the opposite: that they see an opportunity to do something different with a familiar concept. Three previous incarnations of A Star Is Born laid the foundation for an archetypal tale of mentorship, tragic romance and the fickle nature of fame. So what would co-star/co-writer/director Bradley Cooper bring to the premise that wasn't already there in 1937, 1954 or 1976? He sticks closest to the '76 incarnation, choosing the music world rather than movies for his milieu. Cooper plays Jackson Maine, a popular troubadour rock star who's wrestling with demons, substance abuse and—in a twist for this version—progressive hearing loss. After one gig, he stumbles into a bar where he finds part-time singer Ally (Lady Gaga) performing. Sparks fly, and soon Jackson is encouraging Ally to appear on stage with him, sending her career on a rising trajectory that will, inevitably, intersect with his own falling stardom. It's clear fairly early on that Cooper has a distinct concept for building the personalities of these two characters, and their budding romance. Where earlier versions of A Star Is Born did little to explore the history behind the male protagonist's addictions, this one digs deeper into Jackson's troubled childhood, manifested most visibly in his complicated relationship with his older half-brother/de facto caretaker Bobby (Sam Elliott). Similarly, Cooper is willing to spend a lot more time on the foundations of the romance, including a terrific scene in a grocery store parking lot where mutual artistic respect and physical attraction twist and turn around their unequal status. That scene is also the first—but far from last—indication that Lady Gaga is a natural talent as a lead actor. It's more than her ability to read a line convincingly; she nails body language at almost every opportunity, conveying from the outset a kind of incredulousness that this famous man is paying attention to her, without it ever feeling like a girlish case of being star-struck. That same physical performance shines through in Ally's first stage appearance with Jackson, which pulses with the emotion of someone getting a chance she never thought was possible—and, it bears saying, with the effectiveness of "Shallow," one of the many great original songs co-written by Gaga. For its first hour, A Star Is Born feels like it's on track to leave every one of its predecessors in the dust. The downside of such a strong start is that much of the middle third of the movie feels doughy and unfocused by comparison. A key dynamic in that section becomes Ally's transformation from budding singer-songwriter to packaged-and-choreographed pop diva, with Jackson trying to keep her on course even as his own career and ability to manage his addictions deteriorate. Cooper simply finds it hard to maintain narrative momentum, even as he shows an impressive eye behind the camera, with arresting images like Jackson in profile while Ally's backup dancers perform in the background, reduced to alien-like dark shapes straight out of the climax of Close Encounters of the Third Kind. 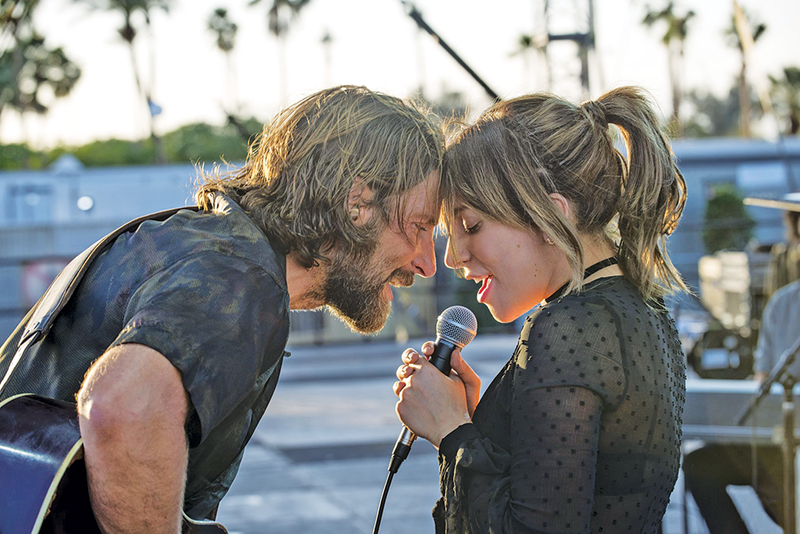 By the time A Star Is Born heads toward its emotional climax—slight spoiler alert for anyone who hasn't seen any of the previous versions: They don't live happily ever after—it's clear that Cooper wants to stick to his guns with a spin on this story that's grittier, more realistic and more psychologically grounded. The flip-side of such a commitment is that components that worked previously in the context of glossy melodrama feel awkward and ill-conceived here. Cooper is clearly in tune enough with the history of this story that he opts to include touchstones like an embarrassing incident at an awards show, and the "I just wanted to take another look at you" line that has already been memed to death. He simply had a unique vision for that story, and the distinctive choices that make this A Star Is Born good are inextricable from the reasons it's not quite great.